Did you know that you can grow carrots and have them be the little ones? 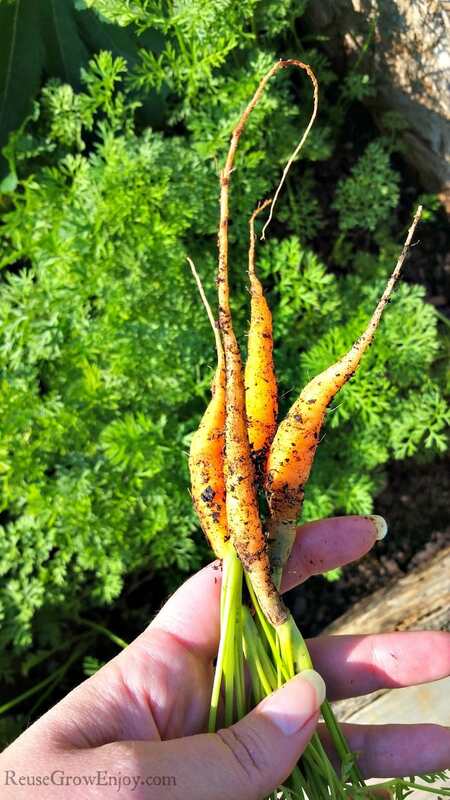 While the ones you grow in our backyard won’t be the perfect little oval-shaped carrots you can buy in the grocery store, they can be just as small and tender! And the good news is that they’re easy to grow! Here are some tips to grow carrots – the little ones! Before you set out to grow carrots, you need to know one thing- the baby carrots you buy at the grocery store are made to look that way. Commercial baby carrots are full-grown (but young) full-size carrots that have been cut and tumbled to create the familiar baby carrot shape. They are not made from broken carrots, and they’re technically not peeled, though they lose their skin during the tumbling process, so they’re still skinless. The carrots you grow in your backyard obviously won’t go through the same process, so won’t look like the carrots you buy. But if you grow the right varieties in the right ways, the carrots you grow will have all the wonderful sweet taste of commercial baby carrots. Plus, your baby carrots won’t be washed with chlorine water (something that’s done to most commercial pre-cut vegetables)! 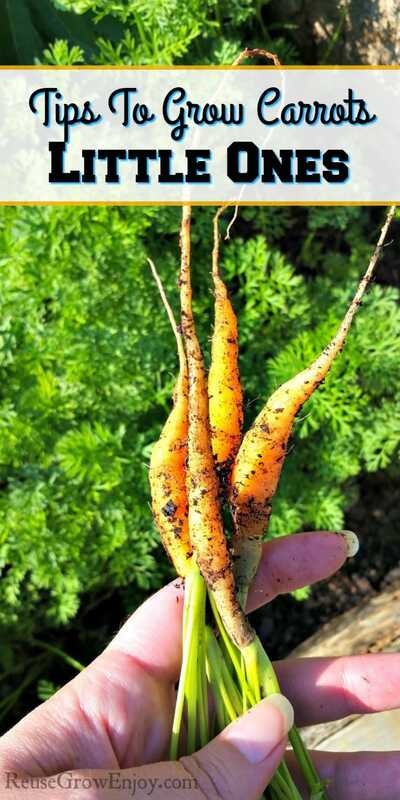 Here are some tips on how to grow carrots at home and have them be the baby ones! Most commercial baby carrots are grown from hybrids that produce great baby carrots. And some non-organic baby carrots may be aided by genetic modification. But this doesn’t mean you can’t find a great baby carrot variety to grow in your own backyard! While you’re unlikely to find the hybrids the commercial growers use, there are several carrot varieties that grow great babies, or that are essentially “baby” carrots when full grown. In particular, you might want to try the Adelaide carrot variety. It is considered a “true” baby carrot because it naturally grows small (only about 3-4″). And it matures quickly (the carrots are ready to harvest in about 55 days), making them a great choice. You could also grow Little Finger or Babette carrots. They take a bit longer to mature (65-70 days) but grow into cute little mini carrots. Or you could pick a variety of standard-sized carrots and just harvest them early (usually at around 50-60 days after planting). But for the easiest experience, it’d be best to try to pick a variety that is known for growing small-sized carrots. If you want to grow your own baby carrots, you’ll need to use the right soil. In particular, you’ll want to use a loose soil. This will allow them to grow down, plus grow straight, creating perfect baby carrots! The soil needs to be free from rocks, sticks and other large objects. It is also a good idea to mix a little sand and or sawdust in with your dirt. Or you could also use a little peat moss. Those all help to keep the soil lose and not become packed in like clay and other dirt. Adult carrots can get pretty wide. If you want to be able to eat your baby carrots as-is, without cutting them slimmer, you’ll want to avoid this. The easiest way to ensure your baby carrots grow nice and slender is simply to give them less space and plant them close together. But as you’ll discover, carrots seeds are very small and hard to plant accurately. Don’t worry about this and instead sprinkle the seeds over the dirt, then cover them with soil so they’re about 1/2 inch below the surface. You can remove the excess carrots as they grow (this is called thinning). By planting your carrots close, instead of growing out they’ll be forced to grow down. So if you’re planning to grow your baby carrots in a pot, make sure the pot is deep enough. Generally, the pot should be at least 8 inches deep for the smaller carrot varieties mentioned above, and 12 inches for longer carrots. If you’re planting them in your garden, plant them in rows with about 6 inches between them. Carrots like sunny locations best but will grow in shaded areas but take longer. So when you grow your own baby carrots, make sure you have them in a full-sun location where they’ll get at least 6 hours of sun a day. But don’t let them dry out under the hot sun! Carrots should stay moist, especially when they’re just starting to grow. But remember, the ideal soil is moist, not sopping wet. And if you do let your carrots dry out, don’t give them a ton of water as soon as you realize they’re dry. This may lead to them splitting their roots. Instead, ease them back into water, working to get their soil back to the ideal moist feeling over several days. Feeding your carrots fertilizer isn’t required, and may not be necessary if you planted them in nutrient-rich soil. But in soil that’s lacking in nutrients (especially the phosphate and potassium that helps carrots grow their roots), some fertilizer can help a lot. Start fertilizing your carrots after their tops are 3 inches tall. A balanced fertilizer tends to work well. Dilute the fertilizer, applying it at a half of the recommended amount. Too much fertilizer may cause your carrots to grow with little flavor. I like to stick to organic fertilizers (like this one) so as not to add tons of chemicals to my plants. That’s essentially it! As I said, baby carrots are pretty easy to grow. As with all plants, weed and watch out for fungi and diseases. And if you love your experience growing baby carrots this year, try not to plant them in the same spot next year. Be sure to plant something else in that spot for a few years. This will help refill the soil with the nutrients necessary to grow carrots in the future! Did you know that commercial baby carrots didn’t grow the way that they’re sold? If you are looking for other gardening tips such as growing larger carrots, here are some others.